The Courtyards Assisted Living and Memory Care is clean and the layout is really good. They have rails on the walls so the residents can hold on if they need to, which is a very good feature. The people there are very professional. I'm pleased with it overall. The dining area is very nice, and the food is good. Mom does exercise, Bible study, and painting. The best way to get to know a community is by scheduling a tour. 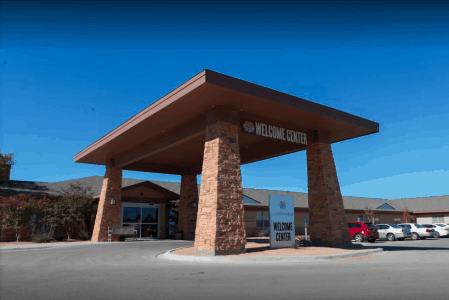 See the facilities, meet the staff and residents, and get a feel first hand what it's like to live at The Courtyards Assisted Living and Memory Care Assisted Living. No matter where we are in life’s journey, home is meant to be a place of comfort and enjoyment. At The Courtyards, our neighborhoods offer a beautiful blend of privacy, safety, security and community to create a warm and familiar environment. Continuous indoor and outdoor walkways provide seamless transitions throughout our spaces. We have strategically located activity areas and dining rooms that encourage social interaction and involvement. This allows our residents to enjoy the opportunity to connect and develop new friendships. Take pride in your new home. The Courtyards offers Assisted Living and Memory Care residences in a full-service, resort-like setting. Designed to allow you to age in place, residents at The Courtyards enjoy the following amenities.